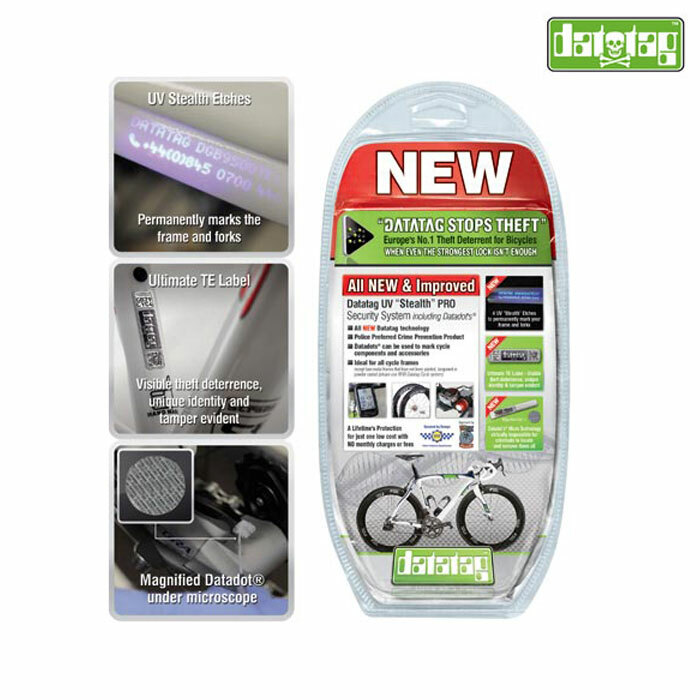 When even the strongest lock isn't enough DataTag Pro UV "Stealth" System for cycles, offer a multi-layered approach to identification that makes life difficult for even professional thieves! Simple to fit and both include visible and hidden identifiers including the latest state-of-the-art "Stealth" UV etching that won't visibly mark your cycle and gives your bike unique finger print. Bike theft is well known to be a problem and many owners think that just by registering them on a database, theft will miraculously stop, but the truth is that registration without the right identification system just doesn't work. The DataTag systems offer premier identifiers combined with probably the most comprehensive database of its kind in the market today. Equally important, DataTag works with the Police to back up the product and provides free scanning equipment and database access on a 24/7 basis as well as technical training. Owners of Datatagged cycles also benefit from reduced premiums from the major insurers. The DataTag UV "Stealth" Pro Cycle System is ideal for all cycle frames and is a Police Preferred Crime Prevention Product. The system protects your bicycles frame, fork and wheels, plus the DataDots can be used to mark all your cycle components and accessories. The system contains 4 UV "Stealth" Etches to permenantly mark your frame, fork and wheels. The DataDots can be used to mark all your cycle components and accessories.